Edwards Hall is home to the Mennonite College of Nursing and to Capen Auditorium, where the Capen Cinema movie lineup is shown weekly during the fall and spring semesters. 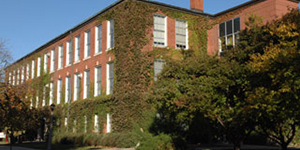 Edwards Hall was opened in 1920 and renovated in the 1960’s. The building is named after Richard Edwards, the second President of our University from 1862–1876. He was originally hired as a math instructor in 1861. Edwards coined the term "Grandest of Enterprises" for the teaching profession. Capen Auditorium was named after Charles L. Capen in 1928. He attended Harvard and was on the Normal School Board.